Dynamic duo Black Violin brought the State Theatre alive on April 12 when they took the stage to perform their unique music. We were told that if we expected a quiet night we were wrong because it was going to be a party. They delivered a party with an outstanding performance, and the full house enjoyed it. 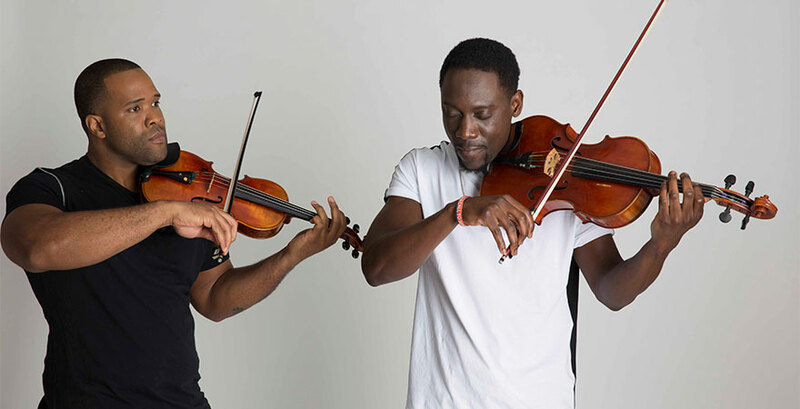 Virtuoso violinist Kevin "Kev Marcus" Sylvester and violist Wil "Wil B” Baptiste hail from Ft Lauderdale and have been friends since high school. They opted for music instead of football even though it wasn’t cool, and when they weren’t in class learning classical, they played Hip Hop. Those earlier years were instrumental in their livelihood as they both received full college scholarships. They united and formed Black Violin, a name taken from the great swing-era violinist Stuff Smith's influential album. Their resume includes performing at President Obama’s Inauguration and in Iraq for U.S. soldiers. Their album Stereotypes is aptly named since part of their mission is to dissolve stereotypes. They dissolved stereotypes about classical music - who plays it and how. In Kev’s words, they have put two things together—classical and hip hop—and the combination is awe inspiring. Wil clutched his violin named Tiffany admiringly and said he was going to serenade her and he did with Ed Sheeran’s "Thinking Out Loud" interwoven with Marvin Gaye’s "Let’s Get it on." The night was filled with their songs including "A Flat," "Stereotypes," "Magic," and "Affection," among others; they all broke my concepts about classical music, giving it new meaning. Other artist’s songs included "Havana" and "Uptown Funk." I heard Mozart and Beethoven in there too, or so I thought. During every show they create a piece on the fly just for the audience, and they did so for us, playing with heart and soul. In addition to the duo, the band also includes drummer Nat Stokes and DJ SPS who were both given the stage to show off their talents. I always love listening to a heartfelt drummer and Stokes delivered as he played passionately. SPS masterfully blended pieces together and for one of his remixes of Beethoven’s 5th a shout out to New Brunswick were included. In addition to the evening show, they also held a school show for students. They addressed the kids in the audience telling them to think outside of the box, to break stereotypes, and not let anyone tell them they can’t do something. A young boy in front of me was spirited and smiling; I bet he left the theater with possibilities on his mind. Their beneficial influence is a gift; they are inspiring to everyone. Defying stereotypes of what’s cool and right, this duo harnessed their talents and created a whole new sound. They’ve replaced the image of a conservative classical musician with one who wears jeans and running shoes, bringing Mozart and Beethoven into modern day with a twist. As we left the theater, "Ave Maria" was playing, a nice touch to an inspiring evening.